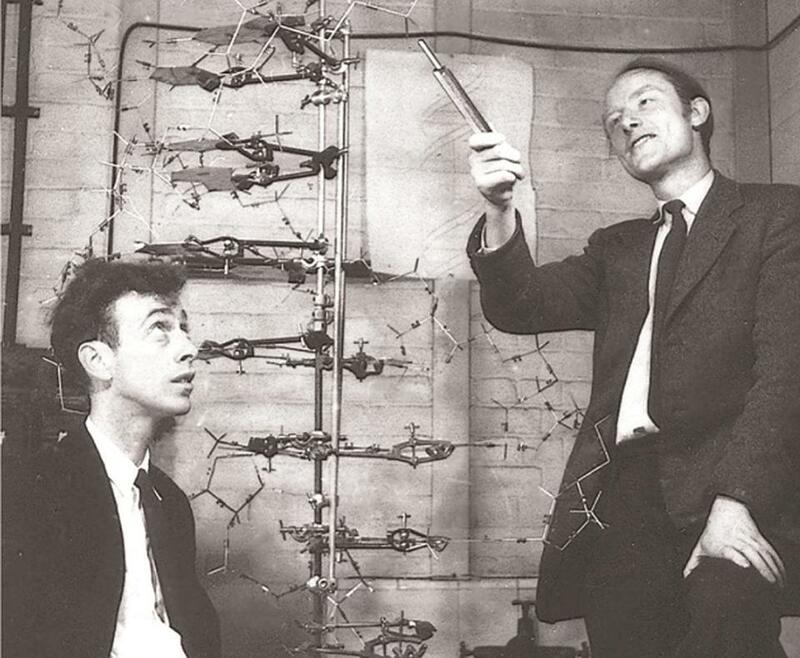 Francis Crick with James D. Watson, co-discoverers of the structure and function of DNA. George Church, a genetics professor at Harvard Medical School, explains what happens next: “The viral genetic message that formerly made perfect molecular sense to the host cell now amounts to nonsense . . . The upshot: multivirus resistance — immunity to all viruses.” Church envisions such a future — which is closer than you think — in the book he coauthored with science writer Ed Regis, “Regenesis: How Synthetic Biology Will Reinvent Nature and Ourselves” (Basic, 2012). This is one of many new titles out in the wake of the Human Genome Project, the wild growth of DNA data, and the dawn of gene therapy. It’s a crazily fascinating and unnerving read. There’s a touch of P.T. Barnum, too. Church got much hype, for instance, because he encoded “Regenesis” (the first such book ever!) into DNA. And I could almost hear a carnival barker call off his near and current realities: Step right up and see the resurrected woolly mammoth! Sip from the drinking cup made from bacteria! Watch the jellyfish that ages in reverse! But then the sci-fi cants toward the human, the marvelous. Take the story of Nic Volker, a 4-year-old from Wisconsin with chronic severe intestinal pain. Multiple surgeries didn’t help, and speculation finally turned to a genetic glitch. Quick refresher: DNA is divided into four bases, labeled G, A, T, and C. In the double helix, a G can only bind to a C, a T can only bind to an A. Nic’s genome was mapped, and there, on the XIAP gene, they found one G-to-A mutation. So doctors took cord blood from a matched donor, grew stem cells from the blood, then did a bone marrow transplant. (The cells for our immune system start in our bone marrow.) In plain English, Nic’s team ditched his broken immune system for a healthy one grown from scratch. He now thrives. Stunning. A similar miracle informs “The Forever Fix: Gene Therapy and the Boy Who Saved It” (St. Martin’s, 2013) by genetic counselor and journalist Ricki Lewis. This time it’s an 8-year-old named Corey Haas with a rare kind of hereditary blindness. He had a defect on his RPE65 gene. This gene should help the retina’s light-sensing cells create rhodopsin, a pigment required to absorb light. His didn’t. Doctors injected a “good DNA” copy of RPE65 into Corey’s eye. Amazing grace: He was blind, but now he sees. “The Forever Fix” doesn’t oversell; others who’ve received gene therapy have not gotten better. Some have died. It’s important to remember this is a new science, full of both promise and setbacks. But whatever the case, we’re firmly in the era of accessibility. Decoding of the first human genome took 13 years to finish at an estimated cost of $400 million. And now? I just clicked on the company site for 23andMe (so-named because humans have 23 chromosomes). You can add a basic genetic test to your cart for $99. Which brings us to “The “$1,000 Genome: The Revolution in DNA Sequencing and the New Era of Personalized Medicine” (Free Press, 2010). Author Kevin Davies paints a coming world in which newborns will be sequenced along with their Apgar test. Meanwhile, celebrities get tested at trendy Hollywood “spit parties” (DNA is read from saliva) by 23andMe, which is run by Anne Wojcicki, wife of Google founder Sergey Brin. Less glitzy businesses are also covered, such as Iceland-based deCodeme, hailed for isolating the genes for type 2 diabetes, breast cancer, glaucoma, and lung cancer. So we’ve got sequencing. But we fall wildly short when it comes to analysis. Indeed, for most of us, testing reveals probabilities for diseases, not certainties. And even if there are certainties, there aren’t enough cures. Why get bad news you can’t fix? That’s one of the anguishing questions in “Am I My Genes? Confronting Fate & Family Secrets in the Age of Genetic Testing” (Oxford University, 2012) by Robert L. Klitzman, M.D. From Albert to Yvonne, 64 people tell their harrowing stories about getting (or not getting) genetically tested for such tragedies as Huntington’s disease. This next book tells how gene mapping, however exciting, is hardly the full story. Nessa Carey, a British scientist and mercifully clear writer, explains why in “The Epigenetics Revolution: How Modern Biology Is Rewriting Our Understanding of Genetics, Disease, and Inheritance” (Columbia University, 2012). What’s epigenetics, you say? It’s the study of inherited changes in a gene’s function that don’t involve changes in the DNA sequence. Another mini-tutorial for you: We now know that a gene doesn’t change in essentials, rather it changes when “instructions” are switched on or off. As such, says Carey, we shouldn’t think of our genome as a map, but as a script and he likens it to the film versions of “Romeo and Juliet” by directors George Cukor and Baz Luhrmann. Same words, vastly different outcomes. The great takeaway here is that DNA doesn’t act in isolation. As Carey says, it’s twined “like a long licorice whip around marshmallows” between proteins called “histones.” And DNA is also flecked with “methyl” groups (bits of carbon and hydrogen) stuck on like “a grape on a tennis ball.” The histones and the methylation process both nudge the on-off switch in our lifetimes. This may explain if and when schizophrenia or autism or cancer kick in. And we now know that environmental trauma hurts our genes, too. Carey recounts 1944’s Dutch “Hunger winter,’’ for instance, when the Nazis blockaded the Netherlands. Caloric intake dropped to 30 percent of daily requirements, which not only harmed babies in utero — but their children and grandchildren (who’ve had higher levels of illness and mortality). Good as these books are, they can’t keep up with the headlong pace of genetic news. Just last month, for instance, a study came out showing that gene therapy — patients’ T cells were removed, reprogrammed, and reinserted — slowed or even reversed leukemia. One person was totally rid of the cancer in just eight days. Reading all this, I’m convinced the 21st century will be known as the century of genetic breakthroughs. But don’t take it from me. Test it.